Again, Svitolina failed to serve out the first set of her match against Vandeweghe, breaking serve to win it, 6-4. After the American player won eight of the next nine games, Svitolina then went on a run of her own. Andddd this time, Svitolina served out the match at the first time of asking! She had to save two break points but actually finished it off with some positive play; a gorgeous dipping forehand pass followed by an advance into the net after a decent serve (it wasn’t a great volley but I liked the intent and decision to move forward!) which Vandeweghe could only hit into the bottom of the net. Errani was 1-5 down in her first match of the week to Saisai Zheng before mounting a sizeable comeback, winning in straight sets, 7-5 6-3. After a surprisingly comfortable win over Yaroslava Shvedova in the second round, Errani was forced to rely on her battling qualities once more. In a lengthy quarter-final that lasted exactly two hours, 22 minutes and 22 seconds (! ), Errani fought back from a 1-4* double break deficit to win, 4-6 6-1 6-4. It’s interesting to note that Errani has reverted back to her original service motion this week. No matter what you say about Errani, her game and her serve, you cannot deny her fighting spirit. Head-to-head record: In their only previous match, Errani defeated Svitolina, 6-2 6-3 in the quarter-finals of Paris indoors… I miss this tournament! Interesting stat: In three matches this week, Svitolina has hit 29 winners to a whopping 90 unforced errors. I don’t think anyone has come out looking good from the stats this week! February 18, 2016 in Dubai, Errani, Svitolina, WTA. WTA Dubai Duty Free Championships: Culling of ALL eight seeds, what a day! WTA Dubai Duty Free Championships: All in for a Sara-Beezus final! ← WTA Dubai Duty Free Championships: Culling of ALL eight seeds, what a day! Really, this match is about the best pusher to win it. Based on Brengle vs Errani match, Brengle managed to hit through Errani. If Svitolina is more consistent compares with Brengle, I think Svitolina will prevail. Also, Errani has to play single and doubles. Even she still has something left in her tank, it won’t be enough to sustain 3 setters. Svitolina in 2 or 3 in case she slips. Sara’s had a very good tournament but I agree with Frank that she’ll most likely be too tired to prevail tomorrow. On the other hand, Elina’s been winning matches with an amazingly low compliment of winners so far and I can’t help feeling that her luck will run out soon. My guess is that Elina will win in 3 sets, and then whoever wins out of either Caroline or Bara in the other semi will win the final. I find it almost surreal that at a premier level event, we have a pair of semifinals between players none of whom are in the top 20. I like it though, it makes a nice change from the more usual situation where the same players crop up over and over again in the final stages. I quite like it too, always nice to have a change-up and all four players left are decent. Hoping Doha’s draw holds up a little bit better though! I agree. I think Svitolinas has better chance to win if she plays Garcia in the final. With Barbora, she will have to deal with a lot of volleys and net plays. The Czech girl is very tricky. I can’t say is fully accurate on the women’s side as it appears now, but what can one do. Surprised you see this as an even match. Svitolina is by far the favorite here. She is well adapted to hard courts, as opposed to Errani who barely breaks even overall in terms of win /loss ratio. Granted Elina did not look great this week but at least she beat some quality players. Even Coco, this week she played some good tennis. I think she would have beaten Errani comfortably today. On the other hand Errani’s matches were slugfests against weaker opposition than Elina’s. Fitness wise Elina has a big edge here, she is quite well rested and had plenty left in the tank tonight, whereas Sara was showing signs of exhaustion towards the end of the match. She will have to win in straight sets if she is to win at all, in my opinion. I’m surprised that more people aren’t giving Errani a shot this week. Your points are all fair though. I’m going for Svitolina but I do think it will go the distance. Errani absolutely exhausted towards the end of the QF 3rd set. The doubles also finished quite late. I really doubt she has anything left in her tank. To be honest, she was lucky to pass Brengle. I havent watched any of Errani’s matches this week but I havent been too impressed with Svitolina. I love her though and id love to see her make the final. Interesting stat on Eli- she’s won a title every year for the past four years and has a 100% record in finals. I was wrong about Svitolina. What did Justin Henin teach her so far? This foolish girl tried so hard to out grind Errani. She wasn’t aggressive and stayed 10 metres behind the baseline. OMG!!! I hope the winner of Garcia vs Barbie match takes the title to save tennis. Ha… Oh dear, Frank. Foolish is a little harsh. She is probably adjusting to some new instructions or something. Remember Radwanska and Navratilova pairing and how that turned out. Anyway, I did question what exactly Justine could bring to the table. Justine’s own success was partly due to a coach(Carlos) who was both a friend and a steely mental mentor when need be. It’s like Serena going on to coach now neglecting the friendship and tutelage Patrick brought to her game mentally(her recent meteoric success). A lot of the women players need coaches who are both friends and taskmasters when need be. Could she be that for Svitolina. I said before that a power game from Svitolina will never happen. She needs to nuance her game strategically ( mental) during matches to lock on her advantage. Justine was a fairly smart player who tried to play with finesse in addition to her talent. I hope it’s the game play smarts she helps Svitolina with. Svitolina is a determined girl, maybe a little bit stubborn, but lol Frank, wouldn’t call her foolish. Well to be fair to Svitolina, her coach was actually telling her to grind it out. Totally the wrong strategy in my opinion. 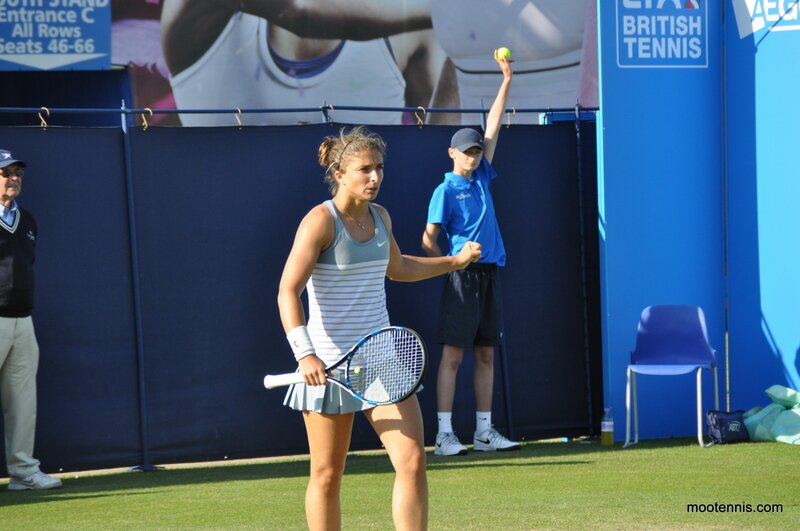 Annabel Croft had it right saying Eli wasn’t dictating or moving Errani enough.